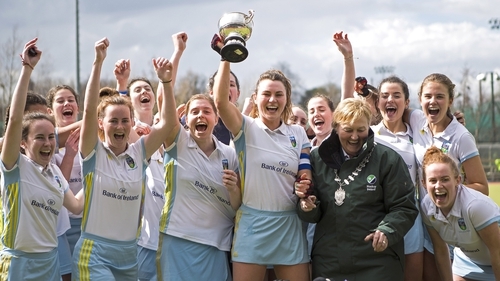 UCD swept to the women’s Irish Senior Cup title – their fourth in seven years – with an excellent win over Pegasus as they proved too strong for the Ulster side at Belfield. It was a far cry from their close-fought semi-final win, eventually getting through in a shoot-out against Loreto after a scoreless normal time while Pegasus edged out Belfast Harlequins 1-0. UCD, off the back of a great defensive platform, played some lovely stuff at times and eventually pulled away in the second half. "Against Loreto, we had a tough match on Saturday but we stepped up our game from the back to the front," said UCD coach Miles Warren afterwards. "We were extremely effective when we kept it simple; we had threat from the back straight to the forwards and then some lovely finishing. "Three were lovely touches in at the back post. You don’t score those unless your players are brave and in the right place. "Everyone looks at UCD and think we are an incredibly attacking team but you can’t attack with the freedom we have if you don’t have the rock-solid defence. "It isn’t just defenders – they are amazing individually and our goalkeeper has been fantastic – but a whole team ethic. It’s the team work rate and that’s what makes us so hard to beat." Keeper Clodagh Cassin was the first to be drawn into action with a solid boot to Taite Doherty’s early effort as Pegs initially applied a great press to steal possession from Lena Tice’s long balls. But when UCD went in front in the 12th minute via a cracking Tice ball that Emma Russell chipped into the roof of the net, the students looked in great shape to retain the title. Deirdre Duke had a number of pot-shots at goal as she looked a menace throughout while Pamela Glass made a series of last-ditch tackles to limit the damage. The second goal, though, was a killer blow. It came seven minutes into the second half with Abbie Russell emulating her older sister when she scored at the back post from an Orla Patton cross. It made it a long way back for Pegasus against a UCD side that has only conceded twice in the national level competitions since the turn of the year. Katie Mullan made the game extra safe when she picked out the bottom corner with UCD’s only penalty corner of the game. Sorcha Clarke completed the victory with time running out, again a back post finish as she nicked in Sara Twomey’s hit across goal. Asked what changed from Saturday’s semi-final, Warren added: "We weren’t able to build play and possession for long periods. A lot of it was them putting us under pressure and us being a little off our game. "We looked like a new side today, completely different. The credit has to go to our players for being able to adjust and adapt. Once they did that, the game went very well." And he is hopeful this will provide more momentum coming into the business end of the league season and their European journey in May. "We still have a long season and we are building towards a finals weekend on May 5th and 6th and then into Europe after that. "This is another big step in the right direction. Occasionally, we don’t perform to our own standards – like Saturday – but this is a springboard to the next five or six weeks."